Even though we have been studying it for hundreds of years, many aspects of the Moon remain mysterious. One question is why the near-side crust is thinner than the far-side crust. Together with my colleague Ian Garrick-Bethell, I suggested tidal heating as an explanation, an effect which was important early in the Moon�s history when it was much closer to the Earth. Tides may also have played a role in generating an early dynamo on the Moon, work which was published in Nature with my former student Tina Dwyer as first author. 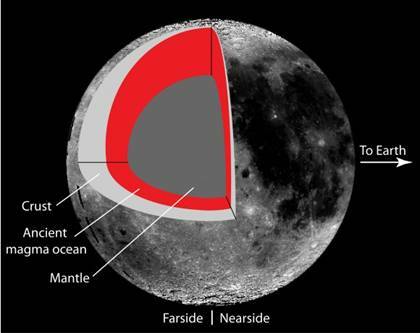 Suggested crustal structure of the Moon due to tidal heating (see the Science article for more details). The techniques used to model the tidal effects were originally developed to study Jupiter�s moon Europa! I was a Guest Scientist on the GRAIL mission to measure the Moon�s gravity field. One of my interests in this mission was in getting a better constraint on the structure of the deep lunar interior. Some preliminary results are published here and a more thorough study is here.